"My name is Meghan Chase. 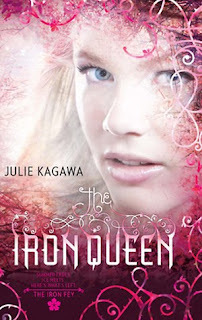 Julie Kagawa really pulled at my heart strings in The Iron Queen. There were moments when I thought that I should just stop reading because I didn't want to know what bad thing was going to happen to them next. Of course what would be the point of the book then. Being that the ground work of the story had already been laid, we really saw the characters develop in this book. Ash and Meghan's relationship really had the chance to take off since they are no longer denying themselves and I loved every second of it. Puck of course is always the comic relief and kind of mellows out the more serious aspects. He also of course has his own issues with the relationship between Meghan and Ash. Grim makes his usual appearance so he can mock their sometimes idiot moments. I found myself relating to the cat and thinking, really it took you this long to figure that out. Some characters we had only known briefly in previous books, stepped up to fill a more supporting role to the main cast. 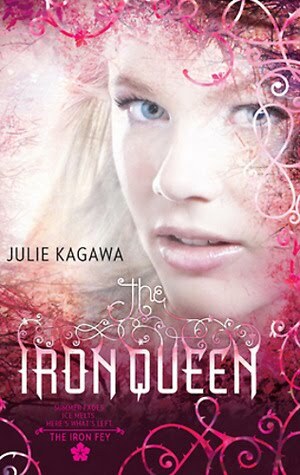 Although the journey itself was important, I felt this book was more about the characters themselves. I, of course, can not get enough of the realm of Faery and there is plenty of it since they don't pop into the mortal realm as much. The end was heart wrenching but I felt that it was the way it had to be. A perfect 3rd book for this series.